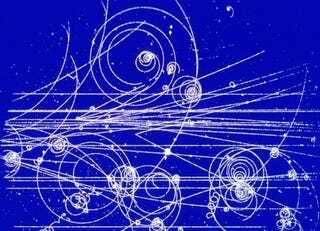 Gravity is usually the arch-nemesis of quantum mechanics, stubbornly refusing to play nice with the forces governing the interactions of subatomic particles. Now we've discovered a rare instance where gravity actually assists quantum interactions, which just might help unify physics. There are four fundamental forces: gravity, the strong nuclear force, the weak nuclear force, and the electromagnetic force. For our purposes, all we really need to know is that the last three forces are crucial to all subatomic interactions, and that it appears that they can unify together under the extreme conditions that existed in the universe's first moments. We know that electromagnetism and the weak force merge into the electroweak force at sufficiently high energies, and we have good theoretical reasons to believe the electroweak force would in turn combine with the strong force at even higher energies. That would get us 3/4 of the way to the fabled Grand Unified Theory, which knits together all four fundamental forces into a single framework. But gravity has no place in this scheme. Indeed, the entire world of gravity described by Einstein's theories of relativity seems to be wholly at odds with the quantum world, as attempts to combine the two mathematical frameworks always lead to a lot of nonsensical results. (For more on this problem, check out our two primers on particle physics.) So any results that even suggest gravity and quantum mechanics can exist in the same cosmos should be considered very good news. And that's pretty much the discovery physicist David Toms has made. He found that, at least in one case, gravity actually smooths out the otherwise bumpy interaction between two sets of particles. He worked with quantum electrodynamics, which considers the interactions between electrons and photons. Above a certain energy threshold, these relationships seem to stop being calculable because they are so overwhelmingly strong. When Toms included a quantum formulation of gravity, he discovered gravity actually calms down this otherwise fiercely strong interaction, reducing the force of interaction between electron and photon to next to nothing at incredibly high energy levels, anywhere between a quadrillion and 10 quintillion giga-electron-volts. Without gravity around, these interactions would be beyond the capability of quantum mechanics to calculate. So, what's the bigger picture here? Honestly, we don't know yet. Even Toms admits that this is just an interesting feature of the equations and not much more. He has no theoretical reason to explain why gravity soothes quantum interactions in this way, and there's no guarantee that this is a universal feature of all particle interactions. Toms does have an idea as to how to push forward. He wants to examine the strength of gravity at these high energies and see what happens, using a variation of the math he used to demonstrate the weakening of the electrodynamic interactions. If gravity demonstrates the same weakening effect of the other forces, then might just be the kind of small but real commonality theoreticians can expand into greater links between the forces. Assuming Toms can demonstrate this effect, it could transform what is now a scientific oddity into a possible road to finally unifying the four forces.